We tried to give Nicky, Sonja, and their family a classic taste of Japan. This included Japanese dining like this great okonomiyaki restaurant (left). It's one of our favorite restaurants near our house, and we try to take visitors here. Okonomiyaki is a cross between a savory Japanese pancake and an omelet, and it is a specialty of southern Honshu island. You cook everything at your table. That may sound like a chore to some, but it's quite a bit of fun and the great thing is that you don't have to clean up afterwards. This week, we saw a famous show about a samurai trainee that needs a bunch of money to prove his worthiness. His family is poor so his father decides to sell the samurai trainee's wife into a pleasure house while the trainee is out hunting, hoping to collect the money to pay off his son's debts and clear his name. A thief steals the money and kills the father before he can make the payment. While hunting in the dark of night, the samurai trainee accidentally kills the thief that stole the money. It was so dark that he can't see who or what he has killed, but he takes the dead man's coin purse because he needs the money. When he finds out the next day that his father was found dead, he assumes that he is the one that killed him. Out of disgrace, he begins to commit suicide. By the time he finds out that he killed the thief and not his father, it's too late because he is bleeding to death. He does, however, have time to pay the money to establish his good name -- he completes the transaction by using his bloody finger as his signature so that at least he dies an honerable samurai (though his mother is now alone and his wife sold into slavery). Very Shakespearean... 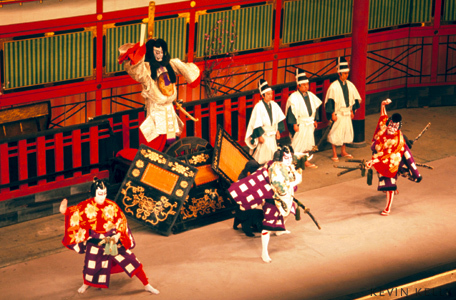 In addition to the powerfully tragic story line, we love the costumes and the elegant movement of Kabuki. Kai has traveled to Finland, Argentina, Switzerland, and now Japan -- all by the age of 3. He's an incredibly good traveler, but partly because Nicky and Sonja include a healthy balance between play for Kai and "play" for the bigger kids (sightseeing). This exposed us to a part of Tokyo we haven't yet seen. Kai brought us to several great parks with play structures, the National "Children's Castle" (a huge building filled with kid's activities), a science museum, two zoos (without us), and more. Kai insisted on having a play partner for each activity, and he would choose a different one of us to join him for each adventure. We were happy to oblige, because it's a long time since we got to climb on jungle gyms and slide down slides. Before allowing a three-year old to stay in our apartment, we asked our landlords, who live directly below us, if it would be OK. Takahashi-san said, "I love children!" and offered us extra bedding if we needed it. I also invited him to our house to meet Kai and his family. He was confused and after several English/Japanese attempts of "come over," "have you visit for tea," and other variations, he finally asked, "Party desu ka?" (is it a party?). "Yes! A party! ", I replied. And our mild mannered dessert and tea turned into a major event, with Takahashi-san telling me how excited he was about the party each time we saw one another during the upcoming days. We made two American desserts, apple crisp and chocolate chip cookies. Despite our best efforts to be gracious and generous, the Takahashi's always seem to outdo us. They brought three Japanese desserts, including very fancy strawberries, a fruit salad with Japanese yogurt sauce, and a yam dish called "University potatoes." The last dish gets its name because it is cheap and easy to make for university students, but fantastically sweet and yummy -- like yam doughnuts. They brought it because it was invented at Tokyo University, where they know that Matt works. Takahashi-san told us about his business as a humble "tailor." From what we can tell, he was actually the president of a custom clothing company in the fashion capital of the East, Ginza. He also told us about his three sons and grandchildren, and asked about Nicky and Sonja's family. In a further "escalation" of generosity, Takahashi-san insisted that we visit for tea the next morning before beginning our day's adventure. There, Mr. Takahashi took us upstairs to show us his drawing room. He started painting when he retired a few years ago, and he has an impressive collection of work. He is most proud of the paintings of his family. The walls on their house feature some of his best work. Meanwhile, Mrs. Takahashi spoon fed Kai ice cream and helped him draw. She also placed a vest on him to "keep him warm" (right picture). We realized later that she must have been measuring him, because she surprised us one morning later that week with a hand-knit red sweater vest custom fit to Kai's size to keep him warm. We simply cannot believe how nice our downstairs neighbors have been. We could not have gotten any luckier with our apartment. If any of you have suggestions for how we can show our gratitude to them, let us know! Sumo is an important part of the Japanese experience, so we wanted to show our visitors. Unfortunately, their visit did not coincide with any of the 6 tournaments held each year. The professor hosting me at University of Tokyo did some research and found that we could visit a sumo practice session. So, we woke up bright and early to head across town to meet him and his family to watch an authentic sumo practice. We wandered through the back streets of the sumo district of the city until we reached the sumo stable. There, we entered a room about the size of a two car garage. It featured a clay sumo ring, a small shinto shrine, and a tatami mat viewing area with room for our group and a few others, but no more. We were so close to the wrestlers that it was almost scary to see them clash repeatedly. Our friends Nicky and Sonja came to visit us for two weeks, and we couldn't have been more excited to host them. They brought along Sonja's parents, their 3-year-old, Kai, and their minus 2 month-old baby-to-be (Sonja is pregnant). Since Tokyo hotels can be small and expensive, we hosted them at our own private "ryokan" (the word for a fancy Japanese inn). Nicky, Sonja, and Kai had the "Emperor's Suite," while we stayed in our guest room (Sonja's parents were in a hotel nearby). It was a blast waking up and playing with Kai each morning, who loved to run around on the tatami floor. And his parents seemed to appreciate a bed where they didn't have to worry about him falling over the edge (they slept on our futon :-). One evening, we had to abort our plans to have an authentic Japanese meal at a fancy tempura restaurant due to a sleepy 3 year old. So, we went to the grocery store and picked up some things to provide our guests with a somewhat authentic Japanese meal that included sushi, tofu, edamame beans, gyoza, and, of course, the long awaited tempura. Reservations for our ryokan are booking up fast, so let us know when you will be coming! After making our trip to the Japanese wedding chapel, we did some research on Japanese weddings and marriages. There are some interesting trends in weddings, and these relate closely to the declining birthrate problem I mention in an article below (also check out this lengthy but interesting article by a Japanese government demographer). Fewer people are getting married in Japan than ever before, and they are getting married later now (average age for women of 28.0, versus the US's 25.1 from a few years back). Also, a recent newspaper article said that 27% of all marriages are happening when the woman is already pregnant. This is causing places like this wedding chapel to bring in people who specialize in planning weddings for brides who are 5-7 months pregnant. A think tank study suggests that people are "too busy" to get married and don't really have any reason to do so because they are financially independent as singles. But, pregnancy is considered a "legitimate excuse" for marriage, which seems to imply that there are actually pressures on people to stay single more than there are to get married. We didn't see any pregnant brides, but the couples were all older than us and we've been married almost 5 years! We arrived to see plasma screens displaying the names of about 20 weddings, all set to occur that day in different locations around the mega facility. We picked one name with kanji characters that we could recognize and pronounce, and decided that we would answer "Tanaka" in case anyone asked which wedding we were looking for. The place was absolutely amazing. With dark woods and brightly colored carvings and inlays, it had an opulence that was uniquely Japanese, but borrowed at least a little something from Louis XIV. The garden features a waterfall that you can walk behind and the main atrium has a natural stream inside, complete with brightly colored carp. We went inside several of the wedding chapels that were not in use. They were quite beautiful, but not at all what we were expecting. We've seen a number of Japanese weddings at hotels and they all seem to be very western-looking. This place seemed like it would be similar in some respects, but the chapels and banquet rooms were very Japanese looking. The seating in the room where ceremonies occur is on long benches, with the two sides facing one another (instead of all eyes looking towards the bride and groom. They were also fairly small, which is because Japanese wedding parties seem to have fewer people. If it's any indication, the place's web site says that its banquet halls can seat anywhere from 30-150, so there is no 400 seat ballroom -- even at one of Japan's mega-wedding chapels. Most unique was the bathroom, which I believe is among the top 5 public restroom facilities in the world. I'm sorry I don't have good photos of it, but these people have a web page devoted specifically to the bathroom experience. The entry has lush mother of pearl inlays. There is a sign explaining the historical origin of the artwork near the sinks. There is a bridge over a small river leading to the toilets. Each stall is actually a rather large room. The ceiling has gold leaf paintings. Rather unfortunately, as L and I discovered, one can see the urinals from the women's restroom because of a gap that allows the river to flow between the two sides. Otherwise, a truly remarkable experience! We had a brief hiatus in blog entries for the last few weeks because we were both working 7 day weeks. L was coordinating a workshop on new observations of the Sun's polar regions. People flew in from around Japan and the U.S. M was preparing to give the weekly seminar at the Earthquake Research Institute. We've only got photos from M's talk, so you can see him in action. Both events finished up successfully! Today we went on a popular Tokyo day trip to the island of Odaiba, located in Tokyo Bay. It sits on what was once an old garbage landfill and is today a modern shopping and day-trip destination. It is connected to the rest of Tokyo by the familiar "Rainbow Bridge" (photo on the right), which you can walk across, drive across, or take a fun monorail along. They have several shopping malls, an amusement park, some museums, movie theaters, and parks. It has futuristic looking architecture (like this sphere building on the left and sculptures in the park below) perfect for a complete day adventure. One exciting attraction on Odaiba is Japan's very own "Statue of Liberty." They have this funny heart shaped photo platform here in front of the Statue in honor of Valentine's day (it's actually an ad for a music group, and there is music coming out of the seat -- see the photo on the right up above). Dozens of Japanese tourists were snapping photos of themselves on the platform, so we decided to give it a try. We asked someone to take our photo. When we got it back, the statue was completely obscured by the heart. We figured that the person didn't know how to take good pictures or couldn't see the screen well, so we tried a few more times. Nobody framed the shot so you could see the statue well. It turns out that people were lining up to take their photos with the crazy heart thing, and the Statue of Liberty was merely a happenstance backdrop for them. There are several good museums on the island, but we only had time for the Museum of Emerging Science. After a day of walking all over the island, our favorite exhibit was one where they have couches set up for you to lie down and look up at a massive globe. It displays data about the Earth's climate and other global data. In the left photo, L waves from the second couch over as the moon spins overhead. Japan is well known for its robotic technology, and the museum has a great set of interactive exhibits about robots. It includes a stuffed seal that arches its back and "purrs" when you pet it, but squeals if you touch its sensitive tail the wrong way (demonstrating touch sensor technology). Other highlights include a number of robotic pets and Asimo, the world's most sophisticated humanoid robot. He interacts with visitors at the museum a few times a day. We posed with him while we was charging in his case, and he looked over at L when she sat next to him. He can walk, talk, and even has robotic friends that play soccer, we've heard. See a few more photos of our adventures by clicking here. I've had a lot of strange experiences in Japan, but to be honest, there are so many similarities between the US and Japan today that I often forget that I live in a foreign country. However, last night was probably the time when the fact that I was living in a foreign country was more apparent than any other. And I think you'll find it came in a rather strange way. The text that first caught my eye was, "In the name of Allah, Congratulations on the occasion of the 28th anniversary of the victory of the Glorious Islamic Revolution of Iran." These are words you probably would not see in an American newspaper today. While I'm not a scholar of history, I think this would be something like Britain running a two page spread congratulating the Americans on the anniversary of their successful revolution in a newspaper around, say, 1811. Apparently, Iran and Japan have a good relationship despite Japan's staunch opposition to nuclear proliferation. Perhaps the relationship is aided in part by the fact that ~14% of all of Japan's oil comes from Iran (the US has banned imports of oil from Iran since the 1980's), and almost 80% from the Persian Gulf in general. The letter from the ambassador is an interesting read, with more than half of the article focused on justifying what they call their "peaceful nuclear activities." You can read the text of the article here, posted on the Iranian embassy's web site (so you may not want to visit it from a government computer -- you never know who is watching or what they'll assume :-). Local elections seem to come at disparate times, as each week it seems like I read a different newspaper article about a governor elected in one prefecture or another, and the impact this will have on national politics. There have been campaign posters up ever since we moved here, but the people depicted on them have changed a few times. The posters are very fancy and sometimes have pictures of Prime Minister Abe or former Prime Minister Koizumi, so I assumed that they were for national elections. I saw the man in this picture on photos displayed around town for several weeks. Then, one day, I was coming out of the train station and he bowed to me and said good morning in Japanese. You can imagine my surprise because I recognized him! You can see his wife beside him wearing a copy of the campaign poster with his photo. Another politician frequently stands outside our train station with a loudspeaker, but I prefer this guy's one-on-one greeting approach. Every morning, I wake up and open our sliding screens to look out upon two fantastic flowering trees in the garden below. We're already making the turn from winter into spring with the arrival of the ume blossoms, beautiful flowering plum trees. We also have two small "bonsai" ume trees outside our front door that are also beginning to open -- one pink and one white. Our landlord, Takahashi-san, told me a story about why there is one pink and one white, which had something to do with history and the Edo period, but I didn't understand the story in Japanese. However, a visit to the shrine near my office also showed that there was one pink and one red ume tree on either side of the shrine. Takahashi-san is very proud of the way his trees look from the street, but I like the way they look from our window! The photo on the left shows a preview of blossoms to come -- I took a stroll over to Yoyogi park (just a few minutes from our house) to check on the cherry blossoms. The buds are growing nicely and I am already planning my picnic among the rows of dozens of cherry trees in a few months. The photo on the right is one of my favorite ume trees in our neighborhood. We pass by it each morning on the way to the train station. Japan has a big problem. Actually, two problems, if you listen to the opposition party in the government. The first everyone can agree upon -- Japan's population is shrinking because the birth rate is falling. One of the key goals of the current prime minister is to implement programs to encourage people to have more children. You may think that the US has a social security crisis looming, but Japan's system makes the US look well prepared. The fertility rate is now around 1.3 children per woman. By comparison, the US also reached a new all-time low for birth rate, but it's fertility rate is still at about 2.1. That means that Japan's population is actually shrinking. There are nearly 130 million people here now, but by 2050, that number could drop below 100 million. Combine that with the same baby-boom effect that the US has (the war had the same effect on both sides of the Pacific), and a mandatory retirement age of 60-62, and you can begin to see the problem. "The number of birthing machines and devices is fixed. All we can ask is for them to do their best." This incredibly insensitive comment turned the entire goverment upside down. There were immediate calls for his resignation and the opposition parties started to boycott sessions in the legislature. For one week, they did not go to a single deliberation. While something similar happened in Texas a few years ago, this is a substantially less confrontational country. In fact, I read about a gubernatorial election here where the two major political parties put up competing candidates for the first time in 32 years (previously, one party declined to put forward a candidate, or they both endorsed the same candidate). So when half the legislature doesn't show up to work in protest, it's a big deal. Interestingly, business went on as usual and the majority party even passed a major supplemental budget. Yanagisawa added on the spot, "I apologize for calling them machines," and corrected his words to "people who have a role in giving birth." Later Monday, Yanagisawa held a press conference at the ministry and said, "The remark was totally inappropriate, and I'm sincerely sorry for hurting the feelings of women." He also said he would like to show through his ministerial work that he is not discriminatory to women, and stressed he has no intention to resign.